Arrival & transfer to Chiang Mai International Youth Hostel. Tour 1: One day elephant safari & bamboo rafting trek: (08.30 - 17.30hrs) enjoy an elephant at work show, visit the Lisu hill tribe village & enjoy an adventure trip with elephant riding & bamboo rafting follows by an ox-cart ride before visiting an orchid farm. This trip includes lunch and all admission fees. Tour 2: One day tour to Chiang Rai (from 07.00 – 20.00hrs): visit Chiang Rai, an important historical city in the Northern Thailand, and also home to a diverse range of hill tribe people. Visit Mae Sai along the Thai-Burma border, Chiang Sean ancient city of ruins, the apex of Golden Triangle along the Mekong River overlooking Laos and Myanmar, and visit to Akha & Yao hill tribe villages. Lunch is included. Tour 3: One day tour to Doi Inthanon National Park (from 08.00 – 17.00hrs): visit the national park of the highest mountain in Thailand with lovely stupa (pagoda), waterfalls and nature trails. Have you ever wished to engage in an interactive experience with local community overseas? One that will bring you close to the hearts of a people who inhabit the sacred grounds of a very ancient civilization. A place where thousand years old rituals and customs still exist. A place where man and nature co-exists peacefully in an environment that is always changing and causing conflict to the modern conservation paradigm. 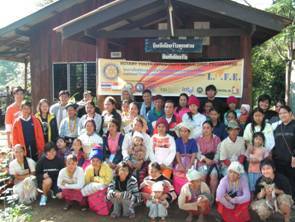 Chiang Mai International Youth Hostel is happy to support a very special group of highland community under the Thai Youth Community Foundation where you will engage in interactive experience. Locating just less than 2 hours from Chiang Mai in the National Park of Doi Suthep/Doi Pui, you will be hosted by a hill tribe villager and participate in communal as well as conduct community involvement activities in the village including the local school. Help feed the little children, join in the planting or harvesting season, help repair homes, teach at the school or gather forest produce with the villagers, you become ‘one’ with the villagers during your stay. And while there, learn more about the plight and achievement of the community. So why wait, come and enquire more about this special programme. 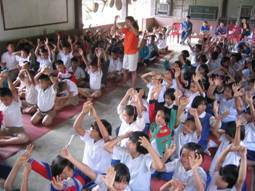 All proceeds from the programme go to the education opportunity fund administered by the Thai Youth Community Foundation. Day 01 Arrival in Chiang Mai. Transfer to Chiang Mai International Hostel to check in. Presentation and briefing by Thai Youth Community Foundation. Price includes stay at Chiang Mai International Hostel (2 nights), stated meals, transfers, hosted accommodation and facilitation services by the Thai Youth Community Foundation.